I like cruising. I like that you only have to unpack once and yet travel to several destinations. I like that your food is included and it's pretty damn good food at that. I like that you can magically wake up in a different city or country every day. I also like to think of it as travel window shopping. If you have never been to a selection of countries, you get a small taste of them for a day and then can decide if you want to return to visit them more in-depth in the future. This what we did on our honeymoon cruise, returning to Cozumel for a week several years later. What I do not like about cruising is getting motion sick, which I have done via all methods of transportation my entire life. 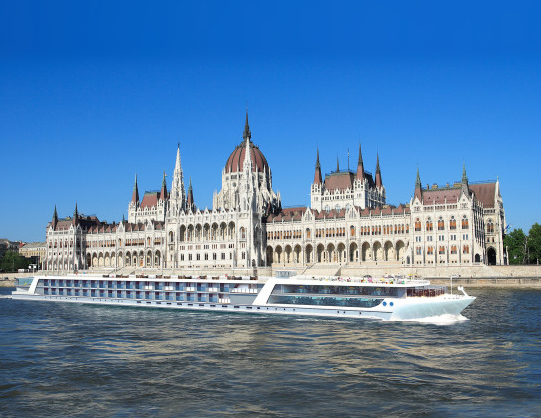 In Europe, though, you can go luxury river cruising! Rivers, the cruising versus the white water type, don't make you motion sick! And because the ships are long and narrow, every room has a view. No inner cabins for the claustrophobic here! The idea of cruising down the blue Danube is an enticing one and one that I would love the opportunity to take. Central Europe is not an area I'm familiar with, yet it is full of my favorite things: history, architecture, and food! My dad went on a Viking cruise a couple of years ago and really enjoyed it. Now there is a brand new river cruise line called Emerald Waterways. Check out their brand new, ultra stylish ships. They are offering a selection of cruises ranging from 8-15 days. Now I'm a greedy person, so asked to choose which itinerary I'd prefer, it would be the 15-day Splendours of Europe. After all, if I'm flying that far and suffering with jet lag, I want to stay as long as possible. Starting in Amsterdam this cruise goes through Germany, Austria, winds through Slovakia, finally ending in Hungary. My only regret is that it doesn't go near Schongau so I could see the places in "The Hangman's Daughter" book series that I read. History follows major travel routes and so rivers have been the highways of history. The best and most historic sites will be along the route and I would be in heaven! Castles, palaces, abbies, museums! Oh my! Some of the cities on this route include: Cologne, Nuremburg, Vienna, and Budapest. Add to all this the gastronomic bliss from all the rich European pastries and I'm sure to come home 10 pounds heavier too! I mean, Austrian pastries! Need I say more? And to be free of having to worry about finding accommodations in each city... such a relief! Here's to the lull of water lapping the sides of my floating cradle as I dream of fairy tales and princes. May this sweet dream come true. This post is an entry to win an 8-day river cruise.